The Angkor as the central area of settlement of the Kingdom of Khmer from the 9th to the 13th centuries. Which was the symbol of the ancient civilization of Khmer people and also revealed as the largest pre-industrial urban center in the world. 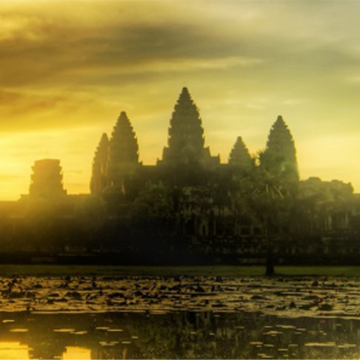 The Khmer Empire Marathon will offer an exceptional opportunity for all runners around the world to experience the ancient course in the area of World heritage through nearly 40 ancient temples along the pretty smooth road race which almost cut through the national forest and rice field of villagers . The 5th Khmer Empire Marathon has happened on 05 August 2018 with more than 3,500 runners from 49 countries, the 6th Khmer Empire Marathon will be hold on 04 August 2019 in the ancient city of Angkor Empire State of the last 11th century with expected over 4,000 runners. 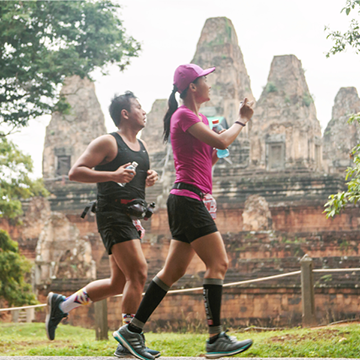 the runners of this race have got the unique experience with the ancient atmosphere and natural scenery along the road race through forest rice fields , traditional villages and ancients temples in the heart of Angkor Era. Race Venue: In front of Angkor Wat Temple, Siem Reap, Cambodia. 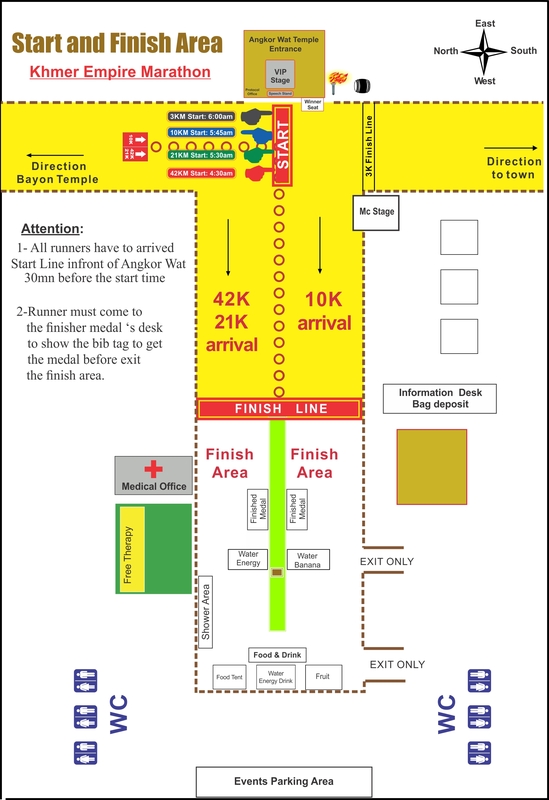 Notice: All participants should arrive at the start and finish line at least 30mn before the start time. From the Siem Reap town to the Angkor Wat temple (start point) around 6km .It takes 20 minutes by Motor Remoque (Tuk Tuk) and 15minutes by Taxi or Bus. All participants of Khmer Empire Marathon must arrive the event place at least 30minutes before the starting time. KEM committee will provide Finisher-Medal for 42Km, 21km & 10km for completed runners at Finishing area, and Running Certificate for 3km completed runners after the race. Free Foods & drinks will be served at the Finish Area. - Every 2km the water station is set up for delivering water and electrolyte drinks to all runners. Some water stations also serve banana together with drinks. - Check point for the Bib tag timing was set up at Angkor Thom (for 42Km at west of Banteay Samre) and near Angkor Wat area. - Every distance of 1Km or 2Km on the running course will be marked by a sign board on the right side of the road. 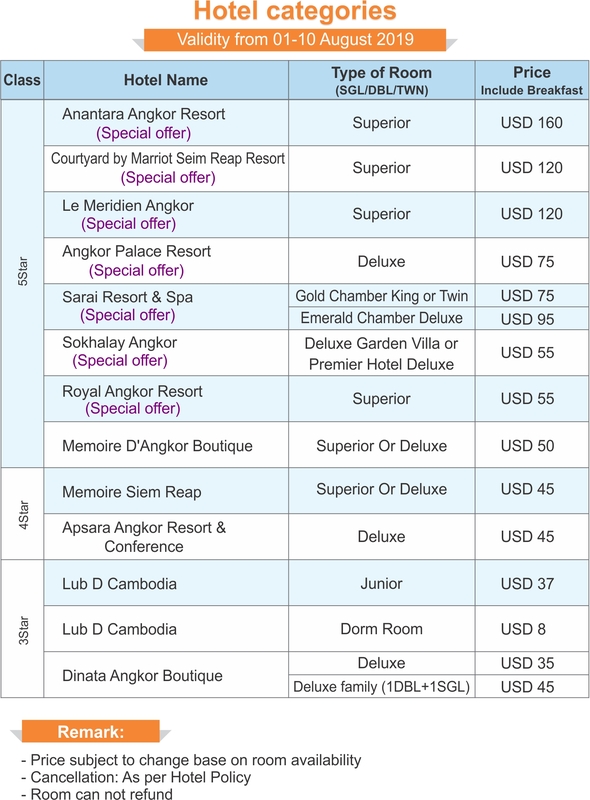 The record will be posted in the Cambodia Events Organizer website 1 day after the event. Khmer Empire Full Marathon is flat course with ancient tree along the course.There are around 17 ancient temples along the course. The runners can enjoy to take photos during running. It is unique course inside the world heritage area. The registration after the deadline 01 July will not be accepted. ** The Event organizer will do its best to provide you with T-shirt size ordered. However, if the T-shirt sizes run out, the Event Organizer will provide you with the best available size. 79 C, St. 155, Sangkat Tuol Tompoung I, khan Chamkamorn, Phnom Penh, Cambodia. ** All expatriate participants should go to representative office of KEM Committee registration office (PNH & REP) as mention above to fill in application form and payment with special rate. Trophies and medals for top three overall. Full Marathon, Half Marathon and 10Km Road Race participants will use the timing Bib tag. Onsite registration is based on our availability with limited spaces at Race Kit exposition which located Apsara Angkor Resort between on 02 - 03 August, 2019 @9:00am-6:00pm. Please note that the above rates exclude 7% handling fee. You will be registered immediately upon we had received the payment in our bank account and please send us the bank slip of payment after you transferred it. The bank charges incurred by transfer must be paid by the participants.Entry fees are not deducted from amount remitted (The runner must cover both service fee). Bib Number should be pinned in front of your running shirt/singlet in a visible way. Change of race distance: You are required to pay the difference between the applicable fee at the time of change and the fee you originally paid if fee for new race distance is higher (No refund if fee for new distance is lower), It is accepted before the deadline and the changing race should be endured the extra admin fee of USD 20 ). Make sure that you have read and understand the Race Rules. ** All registration-fees of Course Inspection and Dinner Party are non-refundable and non-transferable!